At JMI Limousine, our team of trained and dedicated drivers will work hard to guarantee your satisfaction. We are the number one limo service in the Portland metro area, and we are happy to provide our distinguished limo service to our customers living in and around the community of Hillsboro. When it comes to luxury transportation, no one can do as good of a job as JMI Limousine. We offer exceptional luxury transportation for a huge variety of special events. We are experts when it comes to providing transportation for weddings, graduations, proms or homecomings, bachelor and bachelorette parties and many other exciting events. We also offer a Hillsboro funeral limo service. We can also provide luxury transportation for your outdoor adventures in Oregon. Whether you are taking a trip up to Mt. Hood to ski all day, or you are windsurfing in the Columbia River Gorge, our drivers can take you there and back in luxury and comfort. 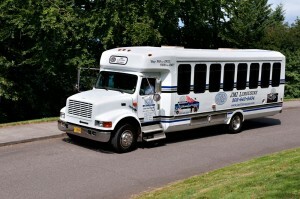 We offer an Oregon wine tour limo service as well. Our skilled and experienced drivers can take you and your friends on a scenic tour of some of Oregon’s finest wineries. We can even arrange for a Portland fly & dine experience for you and your significant other, in which you will get to take a helicopter tour of Portland and dine at a renowned five star restaurant. Since we first opened our doors in 1994, we have had zero accidents. We have achieved this impressive safety record by making sure to regularly inspect and maintain our limousine and party bus fleet. All of our automobiles have passed vehicle inspections performed by master mechanics. Before we consider hiring our chauffeurs, we always have them take a driving skills test as well as numerous background checks. Our drivers represent our business when they are working, which is why we go the extra mile to make sure that our drivers are competent, respectful and courteous. Our headquarters is situated near the center of Beaverton, right off of highway 217. It is just a short, 20 to 25 minute drive down highway 26 to get to our office. We are always willing to take customers on a tour of our facility to show them all of our vehicles and introduce them to our chauffeurs. We want you to feel confident with our service before you book us. Contact us online or by phone to get a free rate quote for our limo service.